Upon request, we also replace buttons, sockets, and transformers of any type. Why choose us to replace your dimmer switches, knobs, and modules? Granted, replacing a knob on your own requires no more than a pair of rubber gloves and a screwdriver. However, if you face a faulty touch dimmer or a burnt module and you’re not convinced that you know what you’re doing, then allow the pros to take it from there. The electricians at Fantastic Handyman have fixed countless lamp dimmers in the past, so you can be sure that they know their profession like the back of their hand. The pros will also bring all necessary equipment: screwdrivers, circuit testers, wire strippers, and the switch itself. The pro will turn off the power supply and double check the switch with a circuit tester. Next, he will remove the plate by unscrewing all bolts that hold it in place. Then, he will get rid of the old dimmer switch and safely connect the new one. He will screw the plate back and test your new dimmer switch for your lamp. Once the job is done, the electrician will determine why the previous switch was faulty. Finally, you will receive a guarantee for your brand new dimmer switch or module! Wiring a dimmer switch in your home will not just make your living room classier – when done right, it will also save energy! Depending on how your lighting system is set up, the pro can replace or install anything from single pole and plug-in light switches (suitable for table/floor lamps) to four-way and multi-location dimmers. When it comes to the visual side of things, the specialist can fit stylish rotary, toggle, or slide dimmers. And if you wish to impress your guests, you can even sci-fi up your home with tap, scene selector, or remote controlled dimmers! Need rotary or sliding dimmer light switches asap? The diligent electrician can arrive for a same-day service, even on a Saturday! Just make sure to mention your dimmer switch type when filling in our online booking form, writing us in our instant web chat, or when making a call to get free quotes or book a session for a time of your convenience. 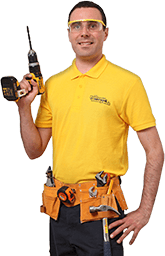 Remember that our contact options are available around the clock, so if you are not in a hurry, you can always schedule dimmer repairs for any workday, weekend, or bank holiday you wish.